1. 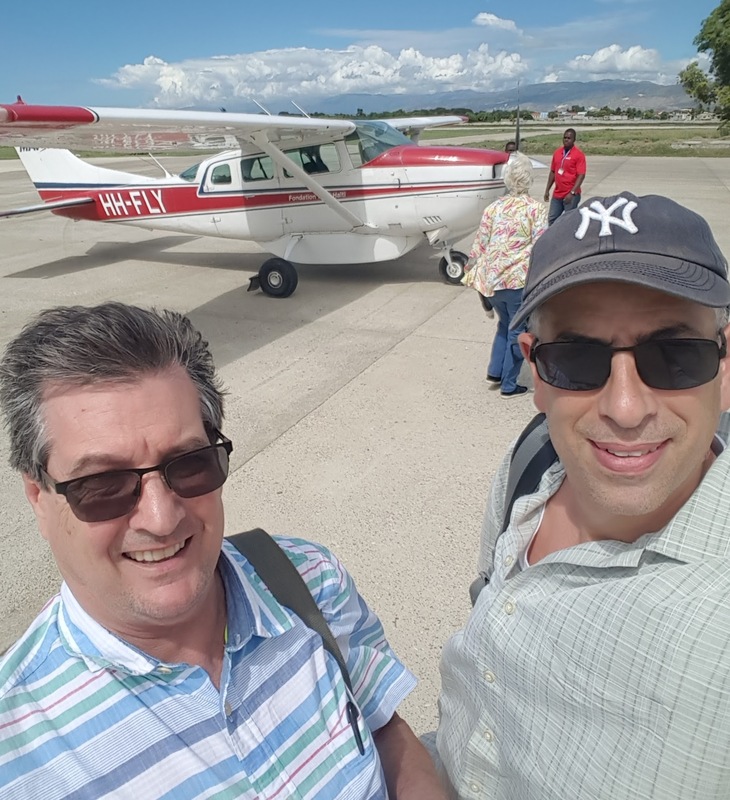 RPR: You have been to Haiti several times, but this was your first trip to Jeremie. What was it like for you? FD: Jeremie reminded me of Jacmel in many ways. Jeremie is a city with a strong history but suffers from the same neglect and lack of infrastructure that most other areas of Haiti suffer from. Like Jacmel, Jeremie’s heart lies with the people of Jeremie who are filled with a strong spirit. 2. RPR: You have worked with other organizations in Haiti; what is your impression of Haitian Homes for Haitian Children? FD: HH4HC is making a real difference in Jeremie. The strong focus on keeping families together and the support for childhood education, health and nutrition is directly impacting the lives of over 70 children and their families. This impact was obvious as we met the children and their families. Hope for a better future was clear. 3. RPR: What did you think of our staff in Jeremie? FD: For any organization to be successful in Haiti they must have a strong support team of locals on the ground. HH4HC not only have committed and capable people supporting their efforts in Jeremie, they have three of the most resourceful Haitians I have met. What they are able to do with the limited resources available to them is simply amazing. 4. RPR: You got to see many of the new homes that were built following Hurricane Matthew. What are your impressions of the emergency rebuilding program? FD: One of the virtues of HH4HC is their ability to pivot quickly and redeploy resources where they are needed the most in Haiti. After Hurricane Matthew, HH4HC moved quickly to rebuild homes for supported families that were impacted by the hurricane. We visited a few of these homes during our time in Jeremie and I was struck by the quality and creativity of these homes. They were built by Haittians local to the area under the guidance of HH4HC local staff using materials that were readily available. Many of these homes were built in locations that made construction very difficult. 5. RPR: How did meeting the children and their families impact you? FD: I have many Haitian friends and have visited many families during the past decade. Haitian people are spirit filled and have the capacity to transform your view of Haiti. The families and children we met during this visit reinforced my belief that we (Americans) can not change Haiti but be can certainly be changed by the people of Haiti!! 6. RPR: You got to visit a number of the schools that our children attend, what struck you about the Haitian schools we use? FD: There was a very wide dynamic range to the schools that are part of the HH4HC ministry. Some schools were very basic with dark, small classrooms while others were very open, bright and busy. But all the schools appeared committed to the education and welfare of the children and I believe the children that are attending any of these schools are being given the change to have their minds opened to hope and possibility!! 7. RPR: You are heading a trip of volunteers this summer who are going to Jeremie to run the Vacation Bible School. What advice would you give to someone who is considering being part of your team? FD: The best advice I give to anyone visiting Haiti for the first time is to leave your 1st world opinions and judgments at home and do your best to be present with the people you meet and spend time with while in Haiti. It is easy to be consumed by the wide-spread poverty and lack of infrastructure you will experience. Embrace it, enjoy the “Quiet” that is Haiti and allow yourself to be transformed. Oh, and wash your hands a lot!! 8. RPR: How are you different because of your trip and working with Haitian Homes? FD: I have to admit that I had a somewhat parochial view of non-profit work in Haiti given the previous foundation I worked with. It was hard to imagine another organization that is effectively being the hands and feet of Christ in Haiti. HH4HC has re-energized my involvement in non-profit work in Haiti and I am planning to stay connected as long as they will have me! 9. RPR: After seeing our children, do you believe they are being well cared for? FD: Based on my witness to the homes that were built post hurricane Matthew and the quality of the schools and after-school tutoring that is supported by HH4HC it is clear that the children being supported are receiving quality support and care. The one thing about HH4HC that was different for me was the on staff nurse and local doctor that cares for the children supported by HH4HC. So in addition to the school and family support, these children are receiving good health care. I was very impressed with this. 10. RPR: What evidence did you see that shows Haitian Homes is making a difference in these families and children’s lives? FD: It is hard to measure progress and impact in Haiti. Even with the help and support of HH4HC, many of these families are living a very simple life. But it is abundantly clear that without the support HH4HC the 70+ children and their respective families would be living in conditions much worse. The best indication of the difference that HH4HC is making is through the eyes of the children we spent time with. There is hope and promise in their eyes. Having a roof over their heads, a dry bed, food, and medical care allows these children to focus on what we all want our children to focus on and that is developing their minds so they can become the next generation of leadership in their community and in Haiti. 11. RPR: After visiting Jeremie, what would you tell a potential sponsor or donor to Haitian Homes? FD: There are many places where a US dollar can make a difference. There are many worthy places to put your money both domestically and internationally. The challenge with donations to large NGOs is the efficiency in which they deploy their money. Not only do NGOs have large administrative overhead, they also spread their money around like peanut butter on a slice of bread. HH4HC has an intentional focus on families in Jeremie, Haiti. Almost $0.9 on the dollar is deployed to help these families and this money is making an impact. God does not differentiate between his people. Helping a Haitian family through HH4HC allows more of your money to be doing God’s work and will transform not only the family being sponsored but will transform the giver!! I promise!! Haitian Homes for Haitian Children is a 501(c)3 Corporation. Donations are tax deductible to the full extent of the law.